As you die-hard Janette Rallison fans know, (Hi Mom! 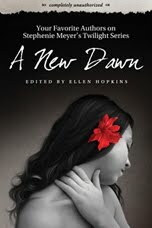 )a year or so ago I wrote a chapter for the book New Dawn, which is a compilation of essays about the Twilight series. Well, after New Dawn came out, Breaking Dawn came out, and the folks at Teen Libris wanted us to update our essays to include the Breaking Dawn book. So we did, and now the new and improved book is out. Teen Libris sent me a copy to give away, so if you’re one of those people who can’t get enough Edward and Jacob, (And really, who can get enough of hot guys with super powers?) then leave a comment and at the end of the week I’ll list a winner.